Have we reached an end point of the cultural history of computing? When Apple marketed its first Macintosh in 1984, it was with Ridley Scott’s famous commercial. Allegedly, Macintosh would save civilization from the totalitarian Big Brother state of George Orwell’s novel 1984, in the commercial incarnated by mainframe systems and IBM. Three decades later, the table is turning. According to a leaked NSA presentation it is now Apple who is Big Brother, and enthusiastic iPhone customers who are the zombies living in a surveillance state (citation needed). Apple’s iOS and other cultural interfaces for smart phones and tablets are designed as alternatives to an open space of DIY, sharing and remix otherwise characterizing cultural computing. However, in order to control the way people consume and produce cultural software, the platforms’ licensing systems also involve heavy monitoring and censorship, or ‘controlled consumption’ (as we have labelled it elsewhere). In other words, the promise of a digital revolution also implies a reaction where dominant actors remain allegiant to the institutions of intellectual property, as Stuart Moulthrop noted already in 1991. In this way, participatory network culture has been subsumed under a strictly monopolizing business model that in several cases also has been caught in delivering surveillance data to military, state and industry intelligence. The computer, which was originally developed as a military technology but (e.g., by Apple) redefined as liberatory, emancipatory and revolutionary, is now back again where it began: as a military intelligence technology. No doubt, the computer interface has redefined cultural consumption, communication and the arts, and has grown to become a primary medium for culture and society. This has changed both the scope and depth of the computer interface, and today it evidently is not just a pragmatic tool but it also integrates individual expressions and cultural tastes. However, what strategies of resistance and critique are left in this contemporary totalitarian digital culture? In a “post-digital” era of reaction (rather than revolution), the Jurassic technologies left behind possess a new kind of fascination. In the following, we want to discuss and question a current interest of materiality and history (a ‘media archaeological’ investment in vinyl records, floppy disks, pneumatic tubes, etc. ), and ask what alternatives materiality may behold? How are we to perceive the re-investment in historical and otherwise lost materials and platforms? In the summer of 2013, The Consortium for the Preservation of Cassette Tape presented the CASSETTE MEMORIES, “a media archaeological excavation of the cassette tape and its use – from a human and tape perspective” (a workshop at the leading North European Rock Festival “Roskilde Festival”, initiated by Andrew Prior, Morten Riis and Søren Pold in collaboration with Roskilde Libraries, http://darc.imv.au.dk/?p=2936). As the invitation to the event reminds us, cassette tapes are deeply associated with more than a generation’s childhood memories, and the first experiences of recording voices, listening to music and creating mixtapes. But not only does the cassette tape represent our past when found in an old drawer, and brought to the workshop to be tampered with, cut up, and looped in new ways; it also appears as a material. The cassette tape consists of magnetic polyester coated with ferro or chromium oxide, pressed against a playback head. It is characterized by relatively poor signals and advanced systems for noise reduction that would create very different listening experiences, depending on the quality of the tape, and the listening device, be it a Walkman, a mono portable or an advanced hi-fi cassette deck. So what are we to make of the nostalgia for cassette tapes? Is it wistful longing for a simpler life and faded childhood memories? Is it a hipster-like search for ‘authenticity’ and ways of differentiating? Is it an aesthetic and sonic search for the grainy ‘lo-fi’ sound quality? Rather than beginning by discussing whether it is nostalgia for the music and voices, or the materiality of tapes, we suggest to enlighten the relation between sign and signal (“the interface”, cf. Andersen & Pold. Interface Criticism) by asking how we should consider history in this tale? In his essay “On the Concept of History” Walter Benjamin writes: “To articulate the past historically does not mean to recognize it ‘the way it really was.’ It means to seize hold of a memory as it flashes up at a moment of danger” (Thesis VI). It seems clear that Benjamin criticizes historicism. We cannot seize hold of the past merely by describing a level that pre-determines a logical course of events. History as ‘the way it really was’ is more ambiguous (as Benjamin’s use of quotation marks also may indicate). In theses, Benjamin explicitly addresses historical materialism, and in continuation of this, we propose to think of the revival of cassette tapes as something else than a revelation of material and technological determination. This implies that it is not merely the productive forces (our tools, instruments, technology, knowledge, etc.) that define our history as a changing mode of production (tribal, feudal, capitalist, etc.) in a simple one-way – techno-deterministic – direction. In other words, cassette memories are not just revelations of how social relations are most fundamentally production relations, and the essential role of the cassette tape in the making of a pro-sumer capitalist system’ (or whatever one chooses to call it). Technology, and the processing of magnetic signals did not make history and did not define our language and social relations in new ways, nor did any other technology. The technology and material production levels are always met with specific cultural interpretations and practices. Likewise, cassette tapes are used through a myriad of practices that still carry potentials. But then what is a magnetic cassette tape? Along with other productive forces and technologies cassette tapes must be seen as part of the same realm as language, in the sense that also language turns out material (as on a cassette tape), and this material is in itself a speech act (at the workshop people talked about sending their voices to their loved ones across the Atlantic and about the investment and gesture of recording and giving away a mixtape). A qualitative separation of material signal processing and the media representation is therefore futile. In every way, the material of the cassette tape (the playback head, the noise reduction system, etc.) is as much a social and linguistic construct (including DIN and IEC defined standards and protocols for equalization), as it is the physical manifestation of a representation (of a memory, a voice, a recording). This ambiguous double-nature allows for a different kind of critique than the mere re-invigoration of how a participatory technology of reproduction brings about a new mode of production that predetermines our social relations (as product relations in the digital economy’s immaterial labor system). How can one ‘brush history against the grain’ in a post-digital era? Instead of a deterministic historicism (in a certain way also potentially present in historical materialism), Benjamin encourages us to think of the cassette tape as something that flashes up in a moment of danger. In the light of history, his use of danger (by a Jew experiencing Nazi Germany) is perhaps even clearer today than at the time. 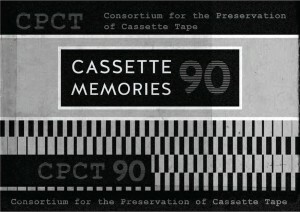 Benjamin uses Paul Klee’s painting ‘Angelus Novus’ as an allegory of history, an angel looking at the past, fixed with open mouth in contemplation: “Where we perceive a chain of events, he sees one single catastrophe.” (Thesis XI) Like Klee’s angel, the role of The Consortium for the Preservation of Cassette Tape is not to enlighten us of a chain of events, but to save the past as critical reflection on a present crisis. It reminds us of the cassette tape as a mode of production before the catastrophe (before it became dressed up by corporate ambitions resembling totalitarian control). As such, it is not of particular interest that the productive force of a participatory tool, and the cassette tape as a tool for reproduction, has defined a mode of production and a social reality of product relations (participatory labor). What is interesting is the discourse and myths around the technologies that has led us to believe that the employment of technology represents a god given chain of events leading to increased efficiency, and that the maxims of the technology (producing, sharing, mixing, etc. ), can create individual freedom and mastery when navigating through social reality (this idea is not unlike Georgios Papadopoulos critique of a totalizing market, (21f.)). Such constructs cannot be addressed as material determinism, but The Consortium for the Preservation of Cassette Tape can lead us to challenge these myths, by exploring a past discourse in the present – as a potential criticism. In this way, the return to old media does not hold an essence. The material turn is realist, in the sense that it expresses an awareness of – not how materials are more real then signs – but of how also our technologies are signs, and our signs technological, and an awareness of how the coupling of signs and material in technology also incorporate a form of control. In this sense, the cassette tape does not hold a truth but is an allegory. To return to our point of departure: Mobile media like smartphones and tablets are examples of what can be characterized as the fifth phase of the user interface. The first user interfaces were the technical control panels and switches that were used to operate the first computers. Often, the agenda was related to automation and the computer used for batch processing. Gradually textual interfaces developed including command line interfaces such as DOS and UNIX and real-time interaction became possible. The Macintosh and 1984 mark the stage where the graphical user interface came out of the labs (where it was developed through the 1960s and 1970s by Ivan Sutherland, Douglas Engelbart, Alan Kay, Adele Goldberg and many more) and became an integral part of the personal computer leading to disciplines such as interface design and Human-Computer- Interaction. With the Web and especially Web 2.0 the interface added a communicative, networked, social dimension, and we are now at the threshold of what we will here call the urban interface, where urban space (also extending beyond the geographical confines of cities) becomes progressively mediated by mobile, embedded and ubiquitous interfaces. Simultaneously, all these interfaces collect data and lead to the myths of big data analysis and smart city development. Unfortunately, the urban interface is currently characterized by the surveillance of a controlled consumption interface, which is coupled with a “war on general-purpose computing” as argued by Cory Doctorow. According to Doctorow, the battle surrounding copyright is extended into locked down platforms or “IT appliances”, which can only run authorized programs in protected sandbox environments, hiding essential parts of the functionality for the user. This, he sees as a big problem for privacy and transparency. As a consequence of this, software culture becomes limited in its potential for developing innovative ways of using and understanding the computer and ultimately developing new forms of software. Furthermore, what is even worse, much of the big data collection and use remains hidden and privatized instead of being discussed in the public sphere and used for common goods. As an alternative to an interface culture of controlled consumption, and as a post-digital response to a corporate subsumption of a digital revolution, we ask if there are new ways of reconfiguring the fifth interface? If so, this would incorporate an awareness of – just as The Consortium for the Preservation of Cassette Tape demonstrates – how representation is always also material, and of how materials become part of signification processes. In other words, a fifth generation interface criticism. Andersen, Christian Ulrik & Søren Bro Pold. “Introduction.” Interface Criticism – Aesthetics Beyond Buttons. Aarhus: Aarhus University Press, 2011. Print. — . “Controlled Consumption Culture.” The Imaginary App. Eds. Paul D. Miller and Svitlana Matviyenko. Cambridge, Massachusetts: The MIT Press, forthcoming. Print. Moulthrop, Stuart. Moulthrop, S. 1991. “You Say You Want a Revolution? Hypertext and the Laws of Media”. The New Media Reader. Eds. N. Wardrip-Fruin & N. Montfort. Cambridge, Massachusetts & London, England: The MIT Press, 2003. 691-704. Papadopoulos, Georgios. Notes Towards a Critique of Money. Maastricht: Jan van Eyck Academie, 2011. Print. Thanks for this piece! With Benjamin’s perspective on history, you introduce another set of critical question marks behind careless “post-” narratives (next to Geoff Cox’s paper). I only wonder whether this doesn’t also imply a question mark behind your proposal of consecutive phases of user interface development in section VIII. Hi Florian, I see your point – and it is a good one. Consecutive phases in history can easily be mistaken. We are of course trying to aim in a different direction – speculating on what interfaces imply, and in particular the ones of current IT appliances. In general I also wonder if this is the right ending for the final article? I think we have heard the critique of Apple, Google, etc. before and in many interesting ways, but there is also an interesting discussion around what potentials/impotentials ‘old media’ hold? This also includes a discussion of what material knowledge actually is? This is perhaps something to discuss at the workshop. Morten Riis has suggested to address ‘memory as it flashes up in a moment of danger’ not only the light of current totalitarian technologies, but also in the light of a material danger – e.g. that of ‘tape salat’ (if that exists as a phrase, but we’ve all had the experience when playing cassette tapes Such viewpoints, I find interesting. Yes good point. Been trying to re-develop this a bit for next version. The five phases should definitely not be seen as supplanting eachother but as new layers and extensions of a representational and technological logic which I still believe is at the core of the computer, though it might be more or less disguised as functionality etc. And as I also commented on your post, I think it is important to relate the post-digital to technology and discuss whether it holds (critical) answers to contemporary technological development. But of course they easily read as being tied to a linear technological development – and that might be problematic in relation to Benjamin’s theses.